It has been nearly a month since I first arrived in India with the anxious and nervous excitement of stepping into a completely new world.So much has happened since I lugged my suitcase from Delhi airport. The trip included me staying at an overnight hotel, a two hour trip to a small, quaint resort for a week of orientations, and another two hour trip on the bus before reaching Ferguson College in the heart of Pune city. The month of September has ushered in a lot of activities so far, but the main celebration has been the Ganpati festival in honor of the God Ganesh who symbolizes wisdom and knowledge. I went with my host mother and the other hostel girls to celebrate the beginning of the festival yesterday with her parents and twin sister. We all set around the Ganesh god while one of the family members took part in adorning the god with flowers, leaves, and fragrance. Colored powders were laid out in front of it as well as the offering of fruits and sweets that were also given to us to eat. Prayers were sung in the ancient Sanskit language, and one individual held up a small golden plate with incents making circular motions in front of the Ganesh idol. I was also given a small flower and some more fragrance to offer to the god to welcome him into the home where he would stay for 10 days. As the old story goes, Ganesh was the son of Parvati and Shiva. While Parvati was taking a bath one day she had instructed her son to guard the door and not let anyone in. Shiva came and insisted that Ganesh let him through, but he refused remaining loyal to his mother’s orders. In a fit of rage that his son would not let him through, Shiva chopped his head off. Parvati was so angered by what happened to her son that she threatened to destroy the world, but being very determined to revive her son, a search was conducted and an elephant head was found put in place of Ganesh’s head. Later that afternoon I rode a riksaw through the city to meet an Ankita and her family to continue the celebration of the first day of Ganpati. 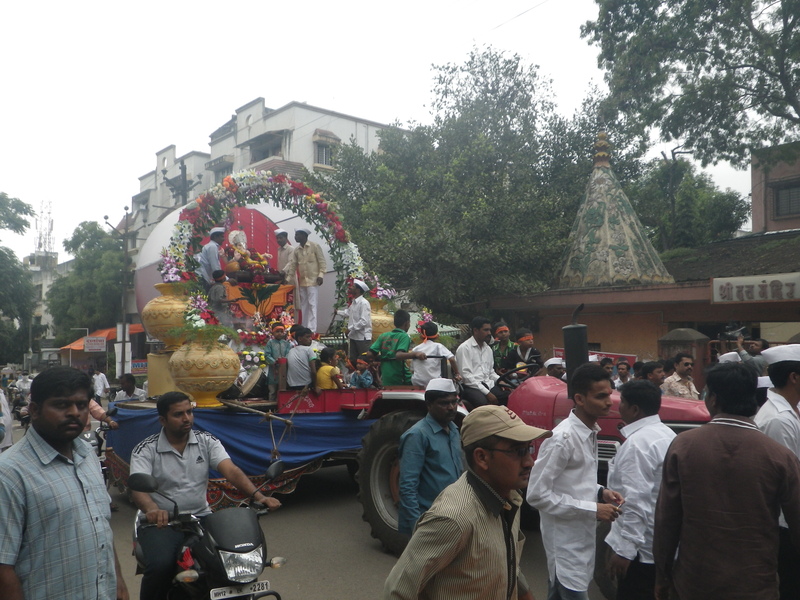 All throughout the streets there were drum lines and huge Ganesh idols being pulled through traffic. There were makeshift stages with a theme in each one that exposed a social or political problem the country continued to face. Some of the stages played music and Ankita had informed me that the music and lights would continue until 10pm sometimes even until 2am. Apparently after midnight some people venture out when there is less traffic to go to visit each stage and temple where Ganesh is held. At her house I was introduced to a new sweet called modak, which is like a dumpling filled with coconut and wheat flour and steamed. It was really sweet and very different from any I had ever tasted since being in India. It kind of reminded me of momos except sweet without the veggies or meats that is often used. Interestingly enough I had to eat this sweet with something spicy, because many of the families believe that when you have something really sweet it has to be balance out with something spicy. It was also the same concept when I was given water. The cup was filled half way with cold water and the rest of the way with warm water. The reasoning for this concept was that the body should remain in balance or else the person could become sick.